"UT/TT Poll: In Texas, Trump holding narrow lead over Clinton" was first published by The Texas Tribune, a nonprofit, nonpartisan media organization that informs Texans — and engages with them — about public policy, politics, government and statewide issues. Trump and his running mate, Mike Pence, had the support of 45 percent of likely Texas voters, compared with 42 percent for Clinton and Tim Kaine; 7 percent for Libertarian Gary Johnson and William Weld; and 2 percent for the Green Party’s Jill Stein and Ajamu Baraka. The remaining 5 percent said they would vote for someone else for president and vice president. “This is the trend that we’ve been seeing in polling for the last two weeks,” said Jim Henson, co-director of the UT/TT Poll and head of the Texas Politics Project at the University of Texas at Austin. In spite of the closeness of the race and the margin of error, the number of polls showing similar distance between the candidates, with Trump in front, “is probably a telling us where this race really stands,” Henson said. Close, with a Trump lead, in other words. The survey was in the field from Oct. 14 to Oct. 23; early voting in Texas began Oct. 24. Trump was ahead with men, 46 percent to 39 percent, while the two candidates each had 45 percent of women’s support. While 93 percent of Democrats support Clinton, 83 percent of Republicans and 46 percent of independents support Trump. Only 19 percent of independents said they support Clinton. And there is a big divide on racial and ethnic lines: Trump led Clinton 57 percent to 28 percent among white voters, but Clinton led 95 percent to 4 percent among black voters and 56 percent to 33 percent among Hispanic voters. Trump’s voters are split when asked for the reason behind their vote: While 47 percent said they want Trump to be president, 53 percent said their position would better be explained as not wanting Clinton to become president. Clinton’s voters were more positive about their own choice, with 66 percent saying they want her to be president. Still, 34 percent of those voting for Clinton said they were with her because they don’t want Trump to be elected. “The lack of enthusiasm amongst Republicans is remarkable,” said Joshua Blank, who supervised the poll. He said the Democrats are voting in favor of their candidate while more Republicans are voting against their opponent than are voting for Trump. Asked to select from a list of issues most important to their presidential vote, 35 percent of Trump’s voters chose “nominating justices to the U.S. Supreme Court,” followed by immigration (17 percent) and the economy (14 percent). “This actually underlines something that is really good for congressional candidates who are really trying to navigate how to manage the unpleasantness for them at the top of the ticket,” Henson said. They can talk about the nation’s highest court instead of their party’s nominee. Clinton’s voters listed the economy first (19 percent), followed by Supreme Court nominations (18 percent) and health care (11 percent). Two other issues — terrorism and national security — combined for the top items on 22 percent of Trump supporters’ lists and 13 percent on Clinton supporters’ lists. Those who said they plan to vote for Johnson or Stein were asked who would be their second choice. Among Johnson voters, 34 percent named Trump, 29 percent named Clinton and 37 percent said they would not vote in the presidential election if they didn’t vote for Johnson. Among Stein voters, the split was 36 percent for Trump, 35 percent for Clinton and 29 percent for no second choice. Asked what kind of president the top two candidates would make, Republicans and Democrats split as you might expect. Among Republicans, 23 percent said Trump would be great, 35 percent said he would be good and 20 percent said he would be an average president. Among those same voters, 86 percent said Clinton would be a terrible president. Among Democratic voters, the numbers flipped, with 39 percent saying Clinton would be a great president, 38 percent saying she would be good and 17 percent saying she would be average. Those voters dumped on Trump: 86 percent said he would be terrible. Independent voters in Texas are more like the Republicans than the Democrats. They are strongly anti-Clinton, with 73 percent saying she would be a terrible president; only 33 percent of independents said the same of the Republican nominee. Eight percent of independents think Trump would be great, 24 percent good and 22 percent average. Asked about the temperament of the candidates, voters split on party lines. But not evenly. While 78 percent of Trump’s voters said he has the temperament to be president, 10 percent said he doesn’t and 12 percent said they don’t know. Among the Clinton voters, 95 percent said she has the temperament to be president and 3 percent said she doesn’t. Trump’s supporters were slightly more likely to think their candidate is honest and trustworthy: 75 percent said he is, 12 percent said he is not and 13 percent were undecided. Among Clinton’s voters, 67 percent said she is honest and trustworthy, 18 said she is not and 15 percent were undecided. The University of Texas/Texas Tribune internet survey of 1,200 registered voters was conducted from Oct. 14 to Oct. 23 and has an overall margin of error of +/- 2.83 percentage points. Among likely voters — those who said either that they are certain to vote or that they have voted in “every” recent election — the margin of error is +/- 3.16 percentage points (n=959). Numbers in charts might not add up to 100 percent because of rounding. This is one of several stories on the latest University of Texas/Texas Tribune Poll. Coming Friday: What Texas voters think about various state and federal officeholders and institutions and what sort of voter fraud they fear in November’s election. UT/TT Poll: In Texas, Trump holding narrow lead over Clinton By Ross Ramsey October 27, 2016 Republican presidential candidate Donald Trump held a three-percentage-point lead over Democrat Hillary Clinton on the eve of early voting in Texas, according to the latest University of Texas/Texas Tribune Poll. Trump and his running mate, Mike Pence, had the support of 45 percent of likely Texas voters, compared with 42 percent for Clinton and Tim Kaine; 7 percent for Libertarian Gary Johnson and William Weld; and 2 percent for the Green Party’s Jill Stein and Ajamu Baraka. The remaining 5 percent said they would vote for someone else for president and vice president. “This is the trend that we’ve been seeing in polling for the last two weeks,” said Jim Henson, co-director of the UT/TT Poll and head of the Texas Politics Project at the University of Texas at Austin. In spite of the closeness of the race and the margin of error, the number of polls showing similar distance between the candidates, with Trump in front, “is probably a telling us where this race really stands,” Henson said. Close, with a Trump lead, in other words. The survey was in the field from Oct. 14 to Oct. 23; early voting in Texas began Oct. 24. Trump was ahead with men, 46 percent to 39 percent, while the two candidates each had 45 percent of women’s support. While 93 percent of Democrats support Clinton, 83 percent of Republicans and 46 percent of independents support Trump. Only 19 percent of independents said they support Clinton. And there is a big divide on racial and ethnic lines: Trump led Clinton 57 percent to 28 percent among white voters, but Clinton led 95 percent to 4 percent among black voters and 56 percent to 33 percent among Hispanic voters. 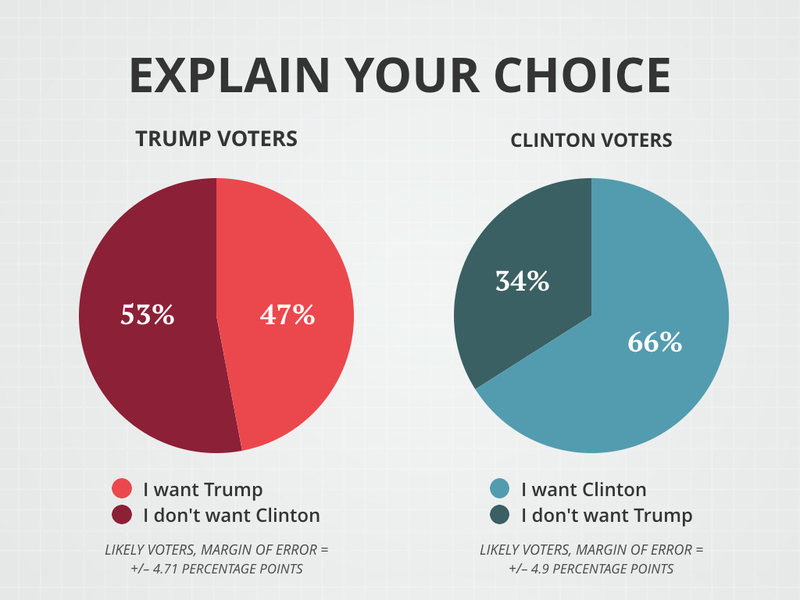 Trump’s voters are split when asked for the reason behind their vote: While 47 percent said they want Trump to be president, 53 percent said their position would better be explained as not wanting Clinton to become president. Clinton’s voters were more positive about their own choice, with 66 percent saying they want her to be president. Still, 34 percent of those voting for Clinton said they were with her because they don’t want Trump to be elected. “The lack of enthusiasm amongst Republicans is remarkable,” said Joshua Blank, who supervised the poll. He said the Democrats are voting in favor of their candidate while more Republicans are voting against their opponent than are voting for Trump. Emily Albracht Asked to select from a list of issues most important to their presidential vote, 35 percent of Trump’s voters chose “nominating justices to the U.S. Supreme Court,” followed by immigration (17 percent) and the economy (14 percent). “This actually underlines something that is really good for congressional candidates who are really trying to navigate how to manage the unpleasantness for them at the top of the ticket,” Henson said. They can talk about the nation’s highest court instead of their party’s nominee. Clinton’s voters listed the economy first (19 percent), followed by Supreme Court nominations (18 percent) and health care (11 percent). Two other issues — terrorism and national security — combined for the top items on 22 percent of Trump supporters’ lists and 13 percent on Clinton supporters’ lists. Those who said they plan to vote for Johnson or Stein were asked who would be their second choice. Among Johnson voters, 34 percent named Trump, 29 percent named Clinton and 37 percent said they would not vote in the presidential election if they didn’t vote for Johnson. Among Stein voters, the split was 36 percent for Trump, 35 percent for Clinton and 29 percent for no second choice. Asked what kind of president the top two candidates would make, Republicans and Democrats split as you might expect. Among Republicans, 23 percent said Trump would be great, 35 percent said he would be good and 20 percent said he would be an average president. Among those same voters, 86 percent said Clinton would be a terrible president. Among Democratic voters, the numbers flipped, with 39 percent saying Clinton would be a great president, 38 percent saying she would be good and 17 percent saying she would be average. Those voters dumped on Trump: 86 percent said he would be terrible. Independent voters in Texas are more like the Republicans than the Democrats. They are strongly anti-Clinton, with 73 percent saying she would be a terrible president; only 33 percent of independents said the same of the Republican nominee. Eight percent of independents think Trump would be great, 24 percent good and 22 percent average. Asked about the temperament of the candidates, voters split on party lines. But not evenly. While 78 percent of Trump’s voters said he has the temperament to be president, 10 percent said he doesn’t and 12 percent said they don’t know. Among the Clinton voters, 95 percent said she has the temperament to be president and 3 percent said she doesn’t. Trump’s supporters were slightly more likely to think their candidate is honest and trustworthy: 75 percent said he is, 12 percent said he is not and 13 percent were undecided. Among Clinton’s voters, 67 percent said she is honest and trustworthy, 18 said she is not and 15 percent were undecided. The University of Texas/Texas Tribune internet survey of 1,200 registered voters was conducted from Oct. 14 to Oct. 23 and has an overall margin of error of +/- 2.83 percentage points. Among likely voters — those who said either that they are certain to vote or that they have voted in “every” recent election — the margin of error is +/- 3.16 percentage points (n=959). Numbers in charts might not add up to 100 percent because of rounding. This is one of several stories on the latest University of Texas/Texas Tribune Poll. Coming Friday: What Texas voters think about various state and federal officeholders and institutions and what sort of voter fraud they fear in November’s election. Disclosure: The University of Texas at Austin has been a financial supporter of The Texas Tribune. A complete list of Tribune donors and sponsors can be viewed here. Reference UT/TT Poll, October 2016 - Summary (356.1 KB) DOWNLOAD Reference UT/TT Poll, October 2016 - Crosstabs (3.3 MB) DOWNLOAD Reference UT/TT Poll, October 2016 - Methodology (68.7 KB) DOWNLOAD "UT/TT Poll: In Texas, Trump holding narrow lead over Clinton" was first published at by The Texas Tribune, a nonprofit, nonpartisan media organization that informs Texans — and engages with them — about public policy, politics, government and statewide issues. Link back to the original article, which is located at https://www.texastribune.org/2016/10/27/uttt-poll-trump-holds-narrow-lead-over-clinton/.